Today I want to share two very similar picture books with you. Similar, because they are both about family reunions and so are perfect for Visit Your Relatives Day. For anyone who has taken a long car ride with the family to a reunion or any other family gathering, you will identify with these two books. 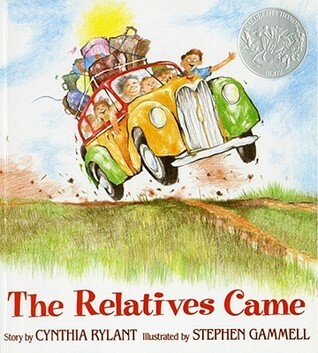 The first one was published in 1985 and won the Caldecott Honor Award the next year. This is a warm and funny story about a family of grape growers who leave their home in Virginia before the grapes are purple enough to pick and travel all day and into the night to visit their family. They hugged and laughed and carried on. You’d have to go through four different rooms and four different hugs just to get from the kitchen to the front room. They had a big supper and quiet talk at the end of the day. And no one was very particular about where they slept so they just piled up on top of one another all over the house. The relatives stayed for weeks gardening, playing music, and eating everything in sight. After a long time, they finally packed up their car and headed back to Virginia thinking about their dark purple grapes waiting for them and missing their family and dreaming about next summer. The illustrations are detailed down to missing socks, broken mailboxes, swings hanging from the trees, toy trucks missing wheels abounded in the grass, and half eaten watermelons. But my favorite illustrations are the expressions of love and happiness on everyone’s faces. It just makes you want to pack up the old station wagon and head back home! In the same vein as The Relatives Came, Dozens of Cousins is a fun-filled, love-filled, laughter-filled story about a family reunion. It shares the adventures of the younger cousins who wreck havoc on the family with their wild and silly antics. The story of this extended family is told in poetic free verse which revels in language and imagery. The rowdy cousins who call themselves ‘beasties’ and ‘ogres’ are loved and defended by their doting grandparents. 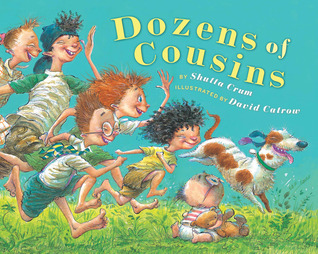 The illustrations in this book are lively and capture the howling good time the cousins have when they finally get to spend time together. I love the rich details and facial expressions in this story too. I don’t want to give away too much, but here’s a book trailer I think you’ll enjoy.